The 2019 Honda Ridgeline will change the way you view pickup trucks. Delivering exceptional performance, comfort and safety, this is an innovative selection for truck lovers. Here at Manly Honda, we provide our customers with a hassle-free experience from start to finish, making the process of picking out the right car a breeze. Our expert staff know all the ins and outs of our in-stock new Hondas for sale and look forward to answering any questions you may have. So, after reading about all the power and innovation of the 2019 Ridgeline below, feel free to make the short trek over from Rohnert Park to experience it for yourself! Whether you’re cruising down the smooth city roads or tackling uncharted territory in nature, the 2019 Honda Ridgeline supports you with exceptional power that comes from its 3.5L V6 Engine. As you propel with up to 280 horsepower, the available i-VTM4™ AWD system elevates your experience by assisting you in tricky weather conditions like snow, sand and even mud. So, next time you’re ready to enjoy an adventurous weekend, take advantage of properly-equipped 2019 Ridgeline’s towing capacity of up to 5,000 pounds and take that boat or dirt bike along for the ride. Like our other Honda models, the Ridgeline truck boasts Honda Sensing® technology so that you can drive confidently everywhere that you go. A few of the driver-assistive technologies include the Road Departure Mitigation System (RDM), Collision Mitigation Braking System (CMBS) and Lane Keeping Assist System (LKAS). These advanced safety technologies are ready to promote your peace of mind as you take on life adventures in this new Honda truck. Offering upscale amenities, the 2019 Ridgeline will change the way you view pickup trucks. Attractive inside and out, the Ridgeline features bright LED low-beam headlights with automatic on/off capabilities. The interior is functional, spacious, and comfortable with its seating capacity of up to 5 people and interior space of up to 109 cubic feet. You can also enjoy plenty of room in the center console to store things like your 10-inch tablet. The 2019 Honda Ridgeline Truck offers a solution to common problems faced in trucks. For example, this Honda model supports you in keeping your cargo items safe with the integrated In-Bed Trunk. This feature can also be used as an ice chest or an area to store away wet gear. There is even an outlet in the wall of the bed that allows you to plug in power tools or a TV right into the truck. 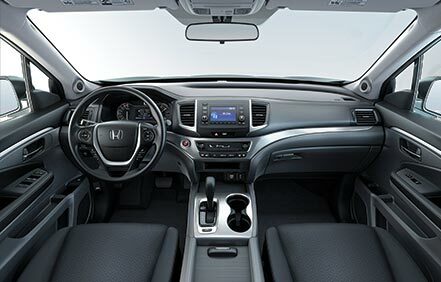 The new Honda Ridgeline offers everything you need for an enjoyable outdoor experience, so swing by our Santa Rosa Honda dealership and enjoy your test drive of the 2019 Ridgeline or any other new Honda that catches your eye today!